Michelle Shain, the Assistant Director of the Center for Communal Research, is a social scientist who combines academic expertise in policy research with a passionate commitment to the well-being of Jewish community. She strives to generate sophisticated research findings that can be used by policymakers and practitioners. Dr. Shain’s primary research focus is the intersection of religion, gender and family formation. Her published work also includes numerous explorations of young adult Jewish identity, Israel education, and antisemitism. 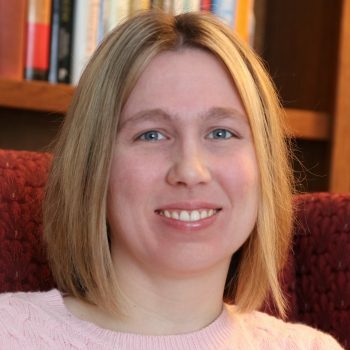 In addition to her peer-reviewed work in journals such as The Journal for the Scientific Study of Religion, Dr. Shain regularly engages with the Jewish community through public presentations, webinars, and op-eds. Before joining the OU, Dr. Shain spent ten years as a researcher at Brandeis University’s Cohen Center for Modern Jewish Studies, where she was a key analyst on the Cohen Center’s ongoing program of research on the impact of Birthright Israel. She also served as the Principal Investigator on impact evaluations for Maccabi USA and Brandeis University’s Schusterman Center for Israel Studies. Dr. Shain holds a BA in Anthropology and Near Eastern and Judaic Studies from Brandeis University, an MA from the Avraham Harman Institute of Contemporary Jewry at the Hebrew University of Jerusalem, and a PhD in Social Policy from the Heller School for Social Policy and Management at Brandeis University. Dr. Shain lives in Sharon, Massachusetts with her husband, Adam, and their four children.